On 27 June 2018 in the mirror hall of the National Academic Opera and Ballet Theatre named after S. Krushelnytska (Lviv), it was presented the project “Genesis” of the Transcarpathian artist Mykhailo Deyak. The exhibition was presented as part of the premiere of the opera “Don Giovanni” by Mozart and the LvivMozArt festival. Mykhailo Deyak has been working on a series of abstract sculptures since 2016 and works for the project “Genesis” the artist created during the year. During this time, they were presented in New York, Kyiv, Uzhhorod and other cities, but for the Lviv audience, these works are demonstrated for the first time. 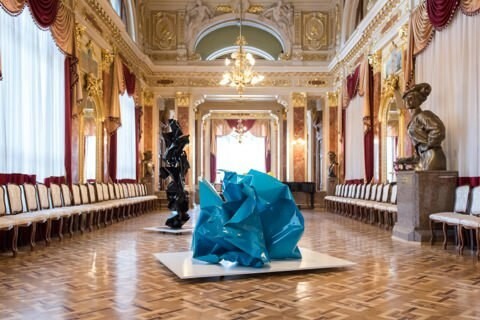 The symbiosis of the room and sculptures creates impression of motion stopped in space, and the contrasts and the dynamics of objects will make it possible to read the works from different directions in a different way. “I do not put a specific idea in this work because I want to encourage the person to think: let the viewer look for himself in space. This project is designed for the visitor's intelligence, makes him think over the meaning. It is in this way there is a dialogue between me and the viewer,” the author explains. The project “Genesis” of Mykhailo Deyak will last until 27 July 2018.